I bought my first dedicated running watch, a Garmin Forerunner 305, not long after I started this blog. It was right before the 2008 Rock 'n' River half marathon, which I wanted a way to keep consistent pace for. Here are my first thoughts on it from back then. 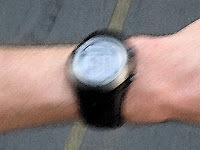 Although I didn't make my goal during that race, I really liked the watch and incorporated it into my training program. And that has been my watch ever since. Over three years now, and I think I've only missed a couple of runs with it - once because it didn't charge right, once because I knew that the charge wouldn't last through a 50 mile ultra.All those miles of sweat, this watch has been my constant companion - sometimes with a heart rate strap, sometimes with a footpod, but always there on my wrist. So, by this point, I'm pretty well addicted to tracking my workouts with the watch. And there's my problem - the 305 is showing signs of age now - needing to be reset more often, the start button sticks sometimes, and the touch wheel is becoming less responsive. The question is - when do I replace it? I don't want to wait until it completely dies - then I'll have some down time while I find a replacement. But it's still pretty functional - is there anything compelling out there that would make it work switching already? There's the issue of battery life - Garmin's Forerunner 310XT wolves that, with up to 20 hours. That would do me for anything but a 100 miler, which is only a glimmer on my future running horizon at this point anyway. Garmin's fancy new watch, just out this year, is the Forerunner 610, which is pretty similar to the 405 but with touch screen instead of the touch-sensitive bezel. I'm sure there are other worthy watches from other companies, too, but I'm pretty locked into the Garmin universe now. Also - I could just start using an Android app like Runkeeper - although that wouldn't give me heart rate data. So does anyone have any input for me? I have the 310XT, I upgraded to it when it came out from the 305. I love it, if you do any swimming or cycling it's loads better than the 305. One option I think it has over the 305 is a virtual partner. Just tell it the pace or speed you want the run/bike to average and it will give you instant feedback in miles and time in regard to where you are with your goal. The 20 hour battery life is great as well, charge it on sunday night go all week and then pop it back on the charger for the next week.